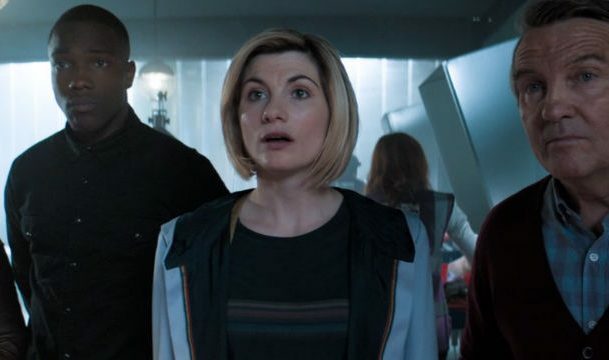 Over the last decades, Doctor Who has famously offered its social commentary and Doctor Who season 11 episode 7 is no exception. “Kerblam!” tackles the social issue of working for massive corporations and the toll it takes. Unlike last week’s historical episode, “Kerblam!” Takes the TARDIS crew to a future obsessed with technology. At the heart of that future is Kerblam, a company that is part delivery service and part Wal-Mart. And of course, there’s a mystery that draws the Doctor in. 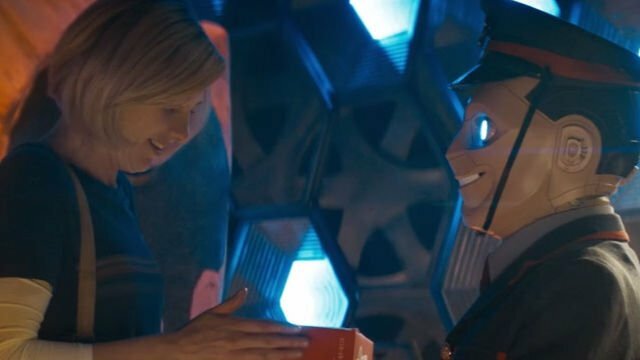 The Doctor is sent a gift from Kerblam!, a company that uses robots to deliver packages. 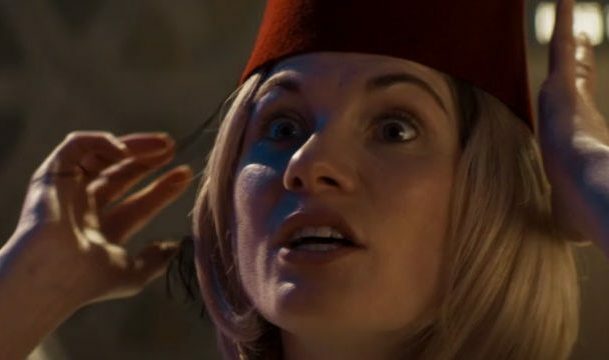 Excited, the Doctor opens it to reveal they’ve gotten a Fez. Whoever sent the Fez also sent a message on the delivery slip. The message reads “Help Me” which draws the Doctor’s interest. They take the crew to Kerblam, a warehouse on the moon. Kerblam delivers packages much like Amazon. Once they arrive, the Doctor uses her sonic screwdriver to get them hired at Kerblam. Kerblam assigns Yaz to distribution, the Doctor and Ryan to wrapping, and Graham to the custodial department. They’re tagged by the company and begin investigating and looking for clues for who needs “help”. The Doctor’s crew begin to get to know the staff. 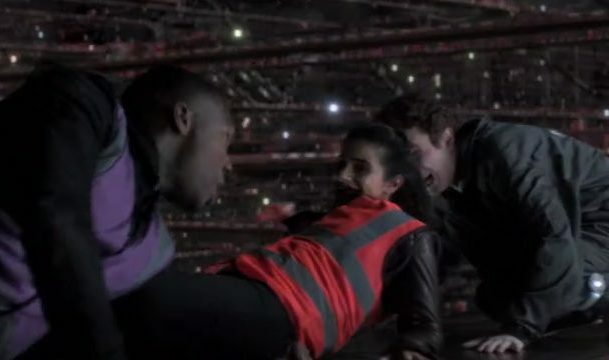 The Doctor and Ryan meet Kira, an employee who dreams of getting a Kerblam package. Yaz meets Dan, a father who sends his money home to his daughter. Graham meets Charlie, his boss. Everyone begins to investigate the corruption at Kerblam and zero in on the delivery bots. The bots begin to reveal their malevolent nature when Dan goes down to distribution to get a package to help Yaz by kidnapping him. Something is clearly wrong at Kerblam. People have been disappearing regularly. The group connects with Judy Maddox, the head of people. The humans at Kerblam are aware they’re lucky to have a job. Only 10% of human beings work. The rest of the population, 90%, is unemployed. The group puts together that the bots are taking employees down to distribution. With the help of a robot named Twisty, the group puts together that it’s the system asking for help. Whatever the Kerblam system wants has to do with the humans who disappeared in distribution. Tension begins to ramp up when the delivery bots take Kira. Carting her down to distribution, they lock her in a sealed room. Ryan, Yaz, and Charlie go looking for her. While in the sealed room she receives a package. By the time Ryan, Yaz, and Charlie get there she begins to open the package. Inside she finds a piece of bubble wrap. She pops it and dissolves, completely obliterated. Meanwhile the Doctor and her companions discover that the Kerblam employees have been liquidated. They also discover an army of Kerblam delivery bots. The bots are planning deliveries of multiple items. While the items are different, they’re all wrapped in bubble wrap that’s primed to explode when popped. Charlie is revealed to be the architect of the delivery bot army. Determined to erode mankind’s trust in technology, Charlie has planned the exploding bubble wrap to try and get people more work. The Doctor works to try and stop the delivery bots from making their delivery. With Twisty the robot’s help the Doctor works out a plan. The robot points out that people who have “the Doctor’s condition” search for blood pressure medication. The Doctor ignores the robot and arranges for the bots to deliver everything to Kerblam and pop the bubble wrap as they do so. The Doctor is forced to sacrifice Charlie when the robots go off. They manage to get the TARDIS crew out and Kerblam promises that they’ll be giving their employees time off so they can fix the corruption in the system. Judy offers the TARDIS team management positions at Kerblam. 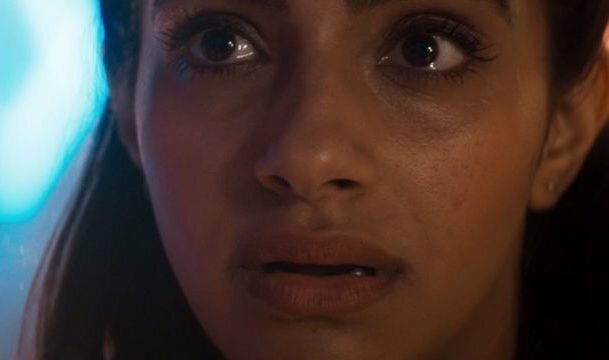 They decline with the Doctor saying they’re “strictly freelance.” As they are leaving, Yaz shares that she wants to tell Dan’s family what happened to him and the Doctor agrees. What did you think about Doctor Who Season 11 Episode 7? Share your thoughts with us in the comments below!